When the Republic of Ireland under 21s beat Azerbaijan 1-0 in Tallaght recently, and thus retained an interest in their European Championship qualifying group, only three of the Irish team were products of the local schoolboy system. It begged the question: where have all the Irish gone? However, close examination indicates that the under 21 grade is a law unto itself. Where a manager might be expected to benefit from the cream of the crop of the under 15s, 16s, 17s, 18s and 19s coming through, such is not necessarily the case, for a variety of reasons. In 2012, manager Noel King hailed his team's 4-2 away win over Italy as "one of the greatest ever in Irish football." On that occasion, eight of his team were home-grown products, but what was more remarkable was the list of players missing that night - Shane Duffy, Greg Cunningham, Robbie Brady, Jeff Hendrick and Richie Towell, all of whom had been regulars up to then. Three of the latter are now regulars on the senior team, whereas not one of the team that won in Italy has achieved that status, and are unlikely to, although Matt Doherty, John Egan and Eunan O'Kane have been capped. What the 2012 figures indicate is that the manager can only deal with the hand he is given, and some years, as in 2012, it's a lot better than others. The present campaign is one of the 'others'. The most successful Irish team ever was Jack Charlton's Euro 88 and Italia 90 squad. It was notably strengthened by players like Andy Townsend, John Aldridge, Ray Houghton and Tony Cascarino, who all qualified on the 'granny' rule. Unlike the present set-up, none were selected at underage level, but joined as adults. In most cases, they were seen as late developers, having been cast aside as not good enough by bigger clubs before finding their feet with lesser lights. The Irish diaspora will always be a fruitful source of talent, and the FAI now has a network of scouts scouring the English scene trying to identify those most likely to add something to the cause. Mark O'Toole heads this operation and has been responsible for bringing Declan Rice into the fold. He doesn't scout simply to make up the numbers, insisting he is only interested in players he believes can go on to play at senior level. O'Toole's hope is that he can bring one into the senior squad each year for the next five years. That's some ask, when you consider that he is talent-spotting teenagers. The player's progress also depends on how well he does with his club - and this is where the main problem lies. In 1988, Jack Charlton was selecting his players from the top clubs in England, but Martin O'Neill no longer has that choice. The English Premier League is now a world league, featuring many of the world's top players. Even the clubs' under 23 teams are full of players from all over the world. As a consequence, the progress of Irish players has slowed to a crawl, with only a handful featuring in the Premier League - and none of them with the top clubs. It's not surprising that over the last few years there has been a more than normal influx to the League of Ireland of good players coming home from England. Players like Trevor Clarke, Dan Cleary, Dan Casey, Danny Kane, Steven Kinsella, Alex O'Hanlon and Sam Byrne. And more of them are also coming back on loan, like the Hale brothers, Rory and Ronan, Daniel McKenna and Dylan Watts. The vast majority who come home are seen as failures, but the lucky ones reboot their careers in the League of Ireland, as Seáni Maguire and Richie Towell did in the last few seasons, earning lucrative moves back to English football. Last week, the FAI, on the back of a good week of underage results, moved into spinning mode, listing all the players from the different squads, who had come through the FAI's Emerging Talent programmes. A notable omission in each case was the schoolboy club which had helped to bring the player through. At present there is a big push on from the FAI to promote the League of Ireland clubs and its underage league structure. It's all a bit rich as far as the schoolboy clubs are concerned for they have been doing this work for years without any financial support from the FAI. For instance, players spent 90 minutes a week on the Emerging Talent programmes, but trained at least twice a week with their clubs, who also looked after them in the summertime. In addition, a lot of country players - buying into the FAI slogan, 'Play with the best against the best' - went to Dublin clubs. In most cases they were sent up by their local club because they were considered too good and, in some cases, were only playing every two weeks, with the danger that they would go to other sports. In most cases, these players were driven up for training and matches by their parents. The FAI introduced an 80km limit to stop this practice, but it was more honoured in the breach than the observance. Dublin clubs had an agreement among themselves not to protest. Then, when it suited the FAI, they held a special EGM to pass a rule that the 80km limit didn't apply for under 16s attached to League of Ireland clubs. 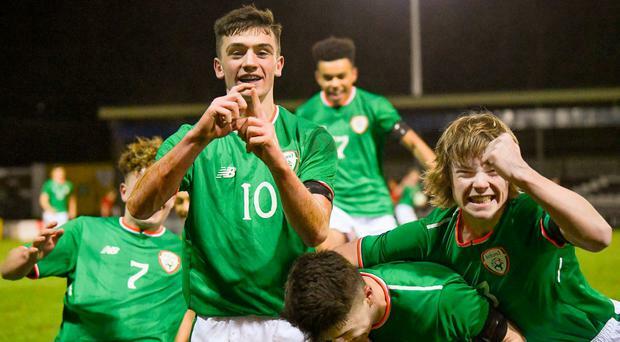 The jewel in the crown for the FAI at present is Colin O'Brien's under 17 squad, which has qualified as top seeds for the European finals in England this summer. All bar one - left-back Luca Connell (Bolton) - have come through the Irish schoolboy system, and they are blessed with players who can score goals, Cork's Adam Idah and Dubliner Troy Parrott being the most notable. Noel King will be watching the progress of this squad with particular interest. He knows that seeding is the key to success. When he began eight years ago, the under 21s were seeded sixth, they are fourth seeds in this campaign, and he's hoping to get to third seed for the next campaign. It's an incremental approach, which could pay dividends if he can bring the 21s to second seed status for the arrival of a good crop of talent. Of course, as the under 21 manager, King has a dual mandate - success for his team and to supply players for the senior team. Despite a win percentage of over 50 in competitive games, success has been elusive, but as a feeder into the senior team he's into double figures. If the present under 17s can bring through as many senior internationals as King's squad of 2012, then the sky is the limit, but there is that major hurdle to overcome in between - English club football. Too many years lost in English football's academia can rob players of their ambition and drive.